Quilters are making blocks quilting them with the batting on the back... How do you get the blocks together? Cut the batting the block size including the finish measurement of the middle of the sashing. Quilt or embroider the block leaving the ¼” seams all around. Sew the sashing to the block size. 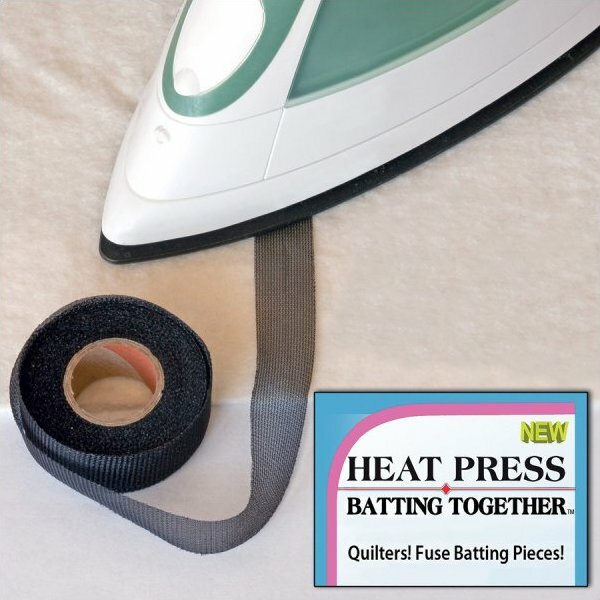 Smooth out the tape with the heated iron without pressure, just the weight of the iron. With right sides together, sew the quarter inch seam all the around your block size. Lay the fabric out on the wrong side of fabric. Lay the tape down the center of the fabric. With your triangle ruler, cut your triangles. With the tape in the center the bias will be stabilized. When cutting large triangles use the 1/5” width tape. turn up your hem width without doing anything to the raw edge. Lay the tape over the edge of the hem.. so the hem is lined up with the center of the tape. Press. You will find that the hems stay soft and pliable. Use the Black for Jeans..
We have found the tape will stay through about 4 washings before starting to be loose.